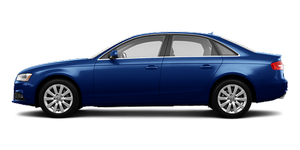 The A4 was recognized as a 2011 Top Safety Pick by the Insurance Institute for Highway Safety. It received the highest possible overall score from IIHS — Good — in frontal-offset, side-impact, roof-strength and rear-impact testing. Standard safety features include antilock brakes, side-impact airbags for the front seats, side curtain airbags for both rows of seats, and an electronic stability system. Rear-seat side-impact airbags are optional. For a full list of safety features, check out the Standard Equipment & Specs page.